MODULO wort cooling unit with integrated Ice treated water tank (ITWT), Plate heat exchanger (PHE) and Glycol cooling unit (GCU). 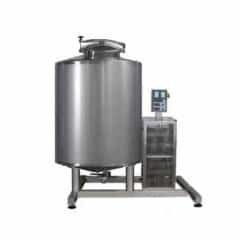 Mobile independent compact equipment for preparation of ice water, wort cooling and wort aeration. 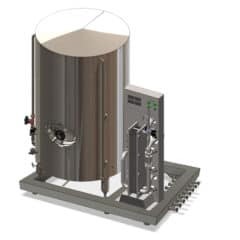 Special module, which integrates the heat exchanger unit for cooling of the wort, stone for aeration of the wort and the storage ice water tank 200 liters with an independent cooling unit on a shared frame with the wheels and adjustable legs. Ice water for cooling of the wort is preprared in a stainless steel insulated tank and is ready for use. Special module, which integrates the heat exchanger unit for cooling of the wort, stone for aeration of the wort and the storage ice water tank 300 liters with an independent cooling unit on a shared frame with the wheels and adjustable legs. Ice water for cooling of the wort is preprared in a stainless steel insulated tank and is ready for use. Special module, which integrates the heat exchanger unit for cooling of the wort, stone for aeration of the wort and the storage ice water tank 400 liters with an independent cooling unit on a shared frame with the wheels and adjustable legs. Ice water for cooling of the wort is preprared in a stainless steel insulated tank and is ready for use. Special module, which integrates the heat exchanger unit for cooling of the wort, stone for aeration of the wort and the storage ice water tank 600 liters with an independent cooling unit on a shared frame with the wheels and adjustable legs. Ice water for cooling of the wort is preprared in a stainless steel insulated tank and is ready for use. Special module, which integrates the heat exchanger unit for cooling of the wort, stone for aeration of the wort and the storage ice water tank 800 liters with an independent cooling unit on a shared frame with the wheels and adjustable legs. Ice water for cooling of the wort is preprared in a stainless steel insulated tank and is ready for use. Special module, which integrates the heat exchanger unit for cooling of the wort, stone for aeration of the wort and the storage ice water tank 1200 liters with an independent cooling unit on a shared frame with the wheels and adjustable legs. Ice water for cooling of the wort is preprared in a stainless steel insulated tank and is ready for use. Special module, which integrates the heat exchanger unit for cooling of the wort, stone for aeration of the wort and the storage ice water tank 1500 liters with an independent cooling unit on a shared frame with the wheels and adjustable legs. Ice water for cooling of the wort is preprared in a stainless steel insulated tank and is ready for use. Special module, which integrates the heat exchanger unit for cooling of the wort, stone for aeration of the wort and the storage ice water tank 2000 liters with an independent cooling unit on a shared frame with the wheels and adjustable legs. Ice water for cooling of the wort is preprared in a stainless steel insulated tank and is ready for use.